I never try a new recipe when I cook to feel better, and I don't think most people do. The familiar is what soothes. When I found out the theme for this week was "Soul Warming", this was the first recipe that came to mind. Our host this week for #SundaySupper is Susan @ The Girl in the Little Red Kitchen. Our fabulous team has made recipes that keep us warm - heart and soul. 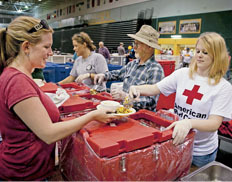 Our prayers go out to those affected by Hurricane Sandy, and hopefully they can get a nice, hot comforting meal. This has to be one of my most favorite comfort foods. Not only because it's delicious, but it brings me right back into my mom's kitchen. I can only remember my mom making one thing in the pressure cooker - stew. It was one of my Dad's favorite meals. She used to serve it in a big bowl "family style" and he used to call it "Cowboy Food", hence the title of this recipe. I still have my mother's pressure cooker from the 1950's. Unfortunately, this was the last stew for the pot. She finally gave out on me. I think the pots back then were make out of German Tanks! If I could get a replacement gasket for it I would, but it's time for a new one. When I cook my stew, the sound of the weight hissing, and jiggling on the pot, brings me right back home. My mom is truly here in spirit when I make this for my family! Cut stew beef into 1-inch cubes, removing any fat. Heat oil and butter in pressure cooker on medium-high and brown beef cubes. Continue cooking beef until all water from the meat evaporates and begins to caramelize. Add onions, salt and pepper, garlic powder and paprika (I just sprinkle it in the pot - maybe 1 tsp. at the most). Saute about 5 minutes. Add beef broth, cover and set 15 lb. weight on cooker. Cook at 15 lbs. pressure for 20 minutes. Let pressure come down on its own. While meat is cooking, peel carrots and potatoes and keep in a large bowl of cold water until ready to use. Remove cover, add potatoes and carrots and cover and bring back to 15 lbs. pressure. Cook for 10 minutes. Place pressure cooker under cool running water in the sink to bring pressure down quickly. 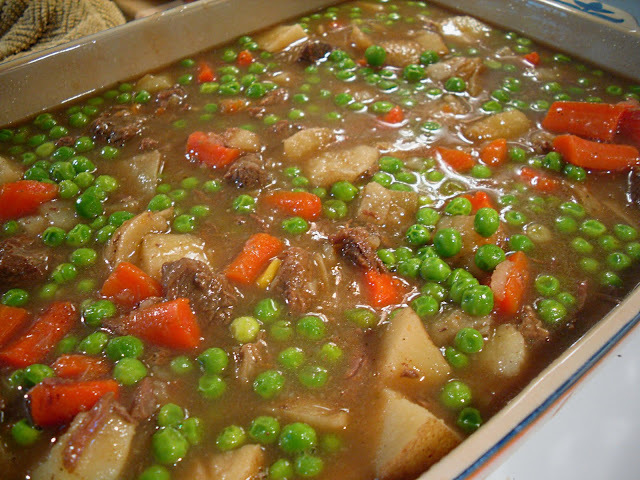 Remove meat, carrots and potatoes to a large baking pan or casserole dish. Bring pan juices up to a boil. Add peas and simmer 5 minutes. To thicken gravy, mix 3 heaping Tbsp. flour into 1/2 cup cold water and stir to combine. Gradually add into simmering pan juices until it is the thickness you like. I kind of make it in between a soup and gravy consistency - Stoup - as Rachael Ray would say. Adjust seasonings. Pour gravy over meat and potatoes in pan, try to wait until it cools off for a minute before you dig in! If you don't have a pressure cooker, I would suggest making this stew in the oven @350 degrees F for at least 2 hours or until the meat is very tender, add potatoes and carrots, bake an additional hour and finish on the stove. oh i wish it was 100*F right now otherwise that would be an amazing dish to make! saving for colder weather for sure! This sounds so great. So good that you have your mom's pressure cooker and the recipe booklet too. I'm sentimental too, so I completely understand that you keep it. 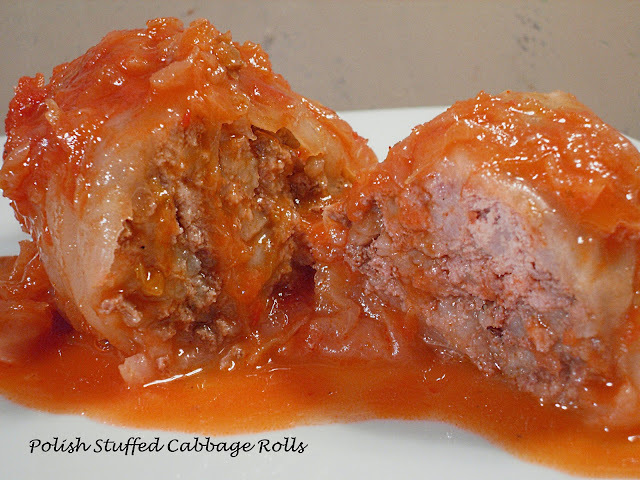 :-) This recipe sounds so tasty and so fast and easy. Thank you for sharing it. This looks so delicious! I can almost smell it. Thanks for sharing. Have a great day! Oh my! The stew looks fabulous!! I'm visiting from the Every Day Sisters party. I DEFINITELY need to find an older pressure cooker (they are the best , of course) If you ever see one at a garage sale, pick it up for me!! I want to try this recipe! I do love a good beef stew. This one looks a lot like the one my dad would make in the pressure cooker. I don't have a pressure cooker so I would have to adapt it for a dutch oven. Great recipe though. I'm so glad you could still join us this week and this dish is perfect Patti! Wow pressure cookers are such an amazing thing. I should probably look into getting one. Makes preparing this stew so much quicker. Patti~ I am so glad you and your family are safe this week. Can you believe I have not used a pressure cooker.... I am thinking I need one immediately! I love your memories associated with this dish...it truly does look and sound like soul-warming food. Delicious! That looks amazing and surely would warm my soul!!! Wow is right! This looks like it would be a welcome sight to any cold and soul-weary person. It's so cook that you helped with the relief effort after Hurricane Sandy! I love myself a good beef stew! Always like to make it different each time I make it too! Thanks for the suggestions! I love that you made this in a pressure cooker! It looks fabulous! Love that certain food memories bring us right back to a time in the past so clearly. Memories warm the soul as much as a hearty bowl of stew. Happy Sunday! 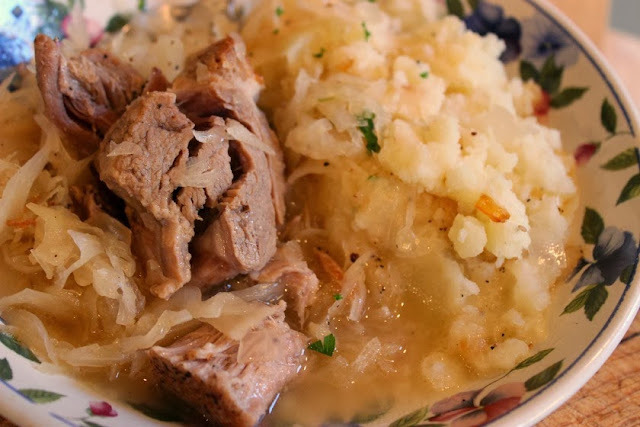 This is old fashioned comfort food, wonderful! I love peas and the pressure cooker is perfect for this type of recipes. What lovely memories of both your parents! Beef stew is both comforting and soul warming...and yours looks fantastic! I am so glad you are ok. I was worried about you. We had lots of flooding but nothing compared to what yall had. I am going to enjoy your soup some time next week. I love the story behind this stew - isn't it amazing how certain foods can bring back so many wonderful memories? And I'm sad that your pressure cooker finally gave out - but at least you and your family had 6 decades with it (that's incredible!). This stew looks so good, thanks for sharing! YUMMY! Do you think I could do this in a slow cooker? I have 100 small appliances and cannot find room for another, so pressure cooker is out of the question. What great memories! My mom cooks corn on the cob in a pressure cooker, but that is my only experience with it! This will be added in my making list soon. 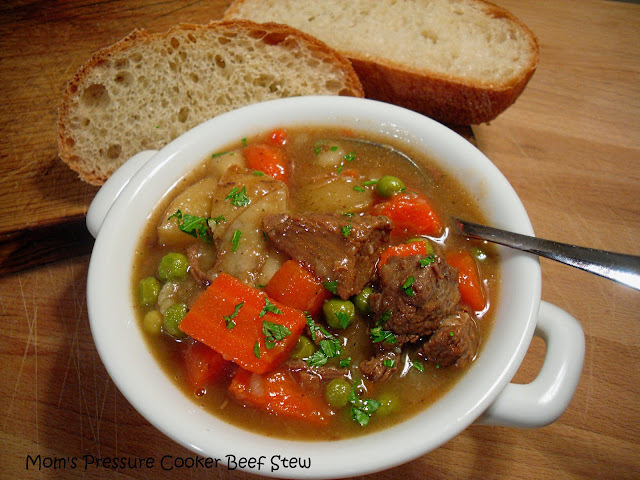 Great stew recipe, love all the ingredients and the idea of slow cooker. Thanks for sharing. Oh my gosh, I really need to buy a pressure cooker and learn how to use it! Love the name of the dish and it looks and sounds fantastic! I would love to learn how to use a pressure cooker. I am too scared to try. This dish is the post child for soul warming dish. Looks amazing. I'll admit, I'm afraid of the pressure cooker. It scares the bejeezus out of me. Your stew looks amazing, and, I agree, familiar is always comforting. Beef stew is one of those recipes that's fun to switch up each time you make it! This looks so good! I don't have a pressure cooker, but I see they're making a comeback!